by Chris Woodford. Last updated: October 28, 2018. Silver always comes behind gold when it's time to hand out the medals but, in science at least, there's nothing second-rate about this soft, shiny metal. It's the world's finest electrical conductor and the best thing you can use to make the perfect surface of a mirror. It has lots of other amazing uses too, from coins and cutlery to antiseptic medicines and photographic film. Let's take a closer look at silver, an amazingly versatile material that people have been using for at least 6000 years! 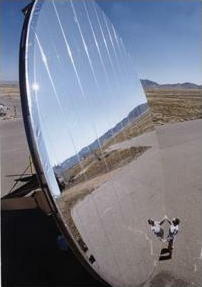 Photo: This heliostat (Sun-mirror) is covered in a polymer (plastic) film made with silver so it reflects the maximum amount of the Sun's energy into a furnace mounted on a nearby tower. Photo taken at Sandia National Laboratories, New Mexico, courtesy of US Department of Energy. When you think of silver, you probably think of something hard, gray, and shiny, but in its pure form silver is actually soft and white. Like gold and the platinum metals, it's a precious metal, both because of its attractiveness and relative rarity: it's only about the 66th most common chemical element in Earth's crust, which contains on average only 0.05 parts of silver per million parts of rock. Chart: Which countries produce the world's silver? Chart based on estimated mine production figures for 2017. Source: US Geological Survey, Mineral Commodity Summaries, January 2018. Although there are small amounts of silver all over the world, deposits large enough to mine economically exist in only a few countries, with over half the world's supply coming from just four nations (Mexico, Peru, China, and Australia). Most American silver (around two thirds to three quarters) comes from the western part of the country, specifically the states of Alaska (now the leading US silver-producing state), Nevada, Idaho, Montana, and Arizona. There are relatively few dedicated silver mines, as such. Most silver (over two thirds of the world's supply) is actually recovered as a byproduct during mining for lead, zinc, copper, or gold. 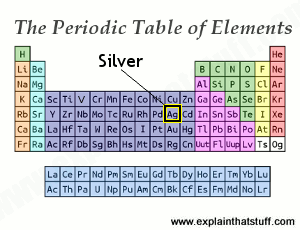 The silver isn't recovered in its pure form, but combined with other elements in ores (raw minerals) such as argentite (silver sulfide), cerargyrite (silver chloride, also known as horn silver), pyrargyrite (silver antimony sulfide, also called ruby silver), and sylvanite (silver gold telluride, made from silver, gold, and tellurium). Ores that contain more than one useful metal are known as polymetallic deposits. 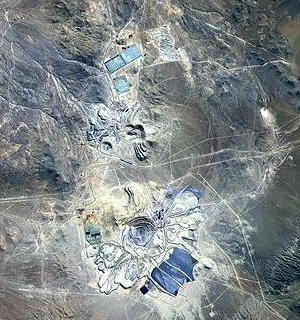 Photo: Escondida Mine in Chile is the world's largest copper mine, but it's also a source of silver and gold. Daily silver production in 1999 was around 110 (short) tons (3.53 million ounces). Photo by NASA/GSFC/MITI/ERSDAC/JAROS, and U.S./Japan ASTER Science Team courtesy of NASA Goddard Space Flight Center (NASA-GSFC). The pure silver is recovered by a multi-stage process that varies according to the exact composition of the ore. Typically the ore is crushed, smelted (heated with air) in a furnace, chemically treated in some way (perhaps reacted with an acid, to dissolve the silver, or mercury, which removes the silver by forming an alloy called an amalgam), and then purified by electrolysis (a process in which electricity is passed through a solution to separate it into its components). We've already seen that pure silver is shiny (capable of being polished), white, and soft. Some of its properties are undeniably "second" to gold: silver isn't so soft as gold and, for that reason, is slightly less malleable (easy to shape) and ductile (easy to pull into wires), though it's still one of the easiest to work of all the metals. If you have about 30 grams of silver (one ounce), you have enough to pull into a wire almost 50 km (30 miles) long! Silver beats gold in other respects: it's the best conductor of heat and electricity of any metal and the best metal to polish to make a highly reflective mirror. Photo: Silver is an excellent conductor of electricity, which is why its biggest use is now in electrical and electronic devices. Here's an example: silver is used in RFID tags, like this label designed to be glued into library books so they can be used with automated self-checkout machines. Pure silver is too soft for most everyday purposes so it's combined with other metals (typically copper) in alloys to make it harder and more durable. Sterling silver is the name given to the everyday silver alloy from which cutlery is made: it comprises 92.5 percent silver and 7.5 percent copper. Coin silver (the alloy once commonly used to make coins) had a greater copper content, originally 90 percent silver and 10 percent copper and later (in half dollars) 40 percent silver and 60 percent copper. Silver used to make jewelry is typically 80 percent silver and 20 percent copper. The silver content of a silver alloy is described by a measurement called its fineness, which is the percentage of silver multiplied by 10. Thus, sterling silver is 925 fine (because it's 92.5 percent silver), while jewelry silver is 800 fine. 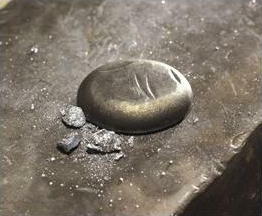 Photo: Hit ordinary silver with a hammer and it squashes. Hit a compound made from silicon and germanium and it shatters into dust (left). But make an intermetallic compound from silver and yttrium and you get a super-hard metal that will withstand repeated hammer blows (right). Intermetallic compounds are broadly similar to alloys and have superior physical, chemical, electrical, and magnetic properties compared to the pure metals from which they're made. Photo taken at Ames Laboratory courtesy of US Department of Energy. What is silver used for? 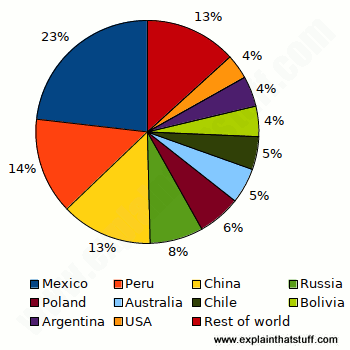 Chart: Where does all the world's silver go? The outer ring (black labels) shows 2016 and the inner ring (white labels) shows 2017. 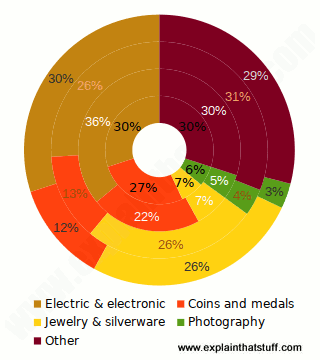 You can see that there was a dramatic reduction in the use of silver for coins from 2016 to 2017, and a notable increase in silver used for electric and electronic components during the same period. Source: US Geological Survey, Mineral Commodity Summaries, January 2017 and 2018. The answer to why we use any material always lies in its physical and chemical properties. Looking at what's special, useful, or unusual about a material always helps us understand why people have used it in the past (or how they might use it in future). This is the basic idea behind materials science. The thing we think of first about silver (its attractive shiny surface) explains why it's so widely used in coins, cutlery, and jewelry. Shininess also makes silver a perfect material for precise, scientific mirrors (a piece of highly polished silver reflects around 95 percent of the light that strikes it), though the expense of using silver means aluminum and rhodium are widely used instead. Still in the world of optics, silver compounds have been used since the 19th century as the basis of photography. Silver halide salts (such as silver chloride, silver bromide, and silver iodide) darken when light strikes them and that simple scientific phenomenon was the basis of taking photos until digital cameras appeared in the late 20th century. 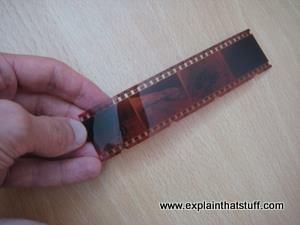 Photo: Old-fashioned photographic film like this uses silver-based chemicals to capture images of the world. It takes quite an effort to turn film back into a printed picture and most people now prefer to use digital cameras instead. That's why there's been a huge decline in the use of silver in photography: in 2017, only 6 percent of the silver used in the United States found its way into photographic applications, down from 50 percent in 1995. Source: US Geological Survey, Mineral Commodity Summaries, January 2017 and January 1996. Since silver is a good conductor of electricity, it comes as no surprise to find it used widely in electrical and electronic equipment (including batteries) and as a constituent of some kinds of solder (the electrical "glue" that fastens components into circuits so they make a perfectly reliable electrical connection). Its lack of chemical reactivity makes silver very suitable as a lining for industrial tanks and containers. It's also used as an important catalyst (accelerator of reactions) in the production of many organic (carbon-based) chemicals. Being unreactive, silver and its compounds find important uses in wound-care bandages. Also in medicine, various silver compounds (including silver nitrates) work as strong antiseptics and anti-bacterial agents, though silver has largely been superseded in joint replacements by titanium, which is stronger and lighter. 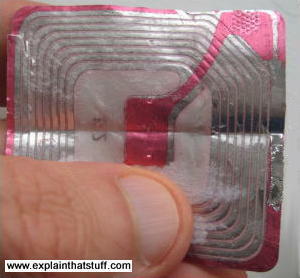 Silver is used in many other applications as diverse as colored glass and heated car windows, water filters, and (as pictured above) the miniature antennas used in RFID (radio-frequency identification) devices. Artwork: The periodic table of chemical elements showing the position of silver. Gold (Au) is the element directly beneath it; that explains why gold is the heavier of the two. Copper, silver, and gold are all in the same group (column), which is why all three conduct electricity exceptionally well. Atomic number: 47 (one silver atom contains 47 protons, 61 neutrons, 47 electrons). Density (at 20°C): 10.5 grams per cubic centimeter. The Silver Institute: Lots of background information from the international association of miners, refiners, fabricators, and wholesalers of silver and silver products. Silver: Statistics and Information: All the latest data on world silver mining, production, and reserves from the US Geological Survey. The Elements: Silver by Susan Watt. New York: Benchmark Books/Marshall Cavendish. A basic 32-page introduction for readers aged 9–12 (grades 4–6). Silver by Brian Belval. New York: Rosen Publishing Group, 2006. Another good introduction for ages 9–12 (grades 4–6). The Periodic Table: Elements with Style by Adrian Dingle. London: Kingfisher, 2014. A more general introduction to the different chemical elements, also aimed at ages 9–12 (grades 4–6).